Metro’s new Largo stormwater facility is making progress towards the Authority’s sustainability goals including reduced water and energy use, carbon emissions, and operating costs. On November 13, Metro hosted a tour of its high-efficiency stormwater treatment facility at Largo. Highlighted during its design phase in a previous post on Metro’s Sustainability Agenda. 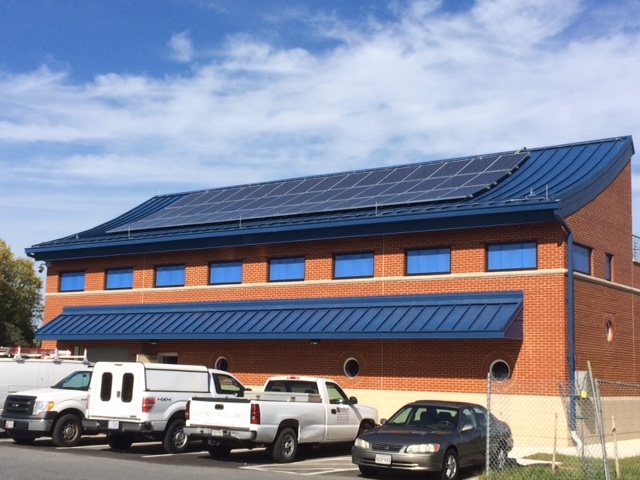 The facility is now fully functional – with a green roof and solar panels that create enough energy to run the plant round the clock. “With a truly innovative design, this facility provides a green and cost effective model for organizations in the region as they make investments in similar facilities” according to Metro’s sustainability manager, Rachel Healy. The open house provided an opportunity for interested regional stakeholders to tour all of the facilities uniquely practical design in operation. Representatives from the Metropolitan Washington Council of Governments, Maryland Department of the Environment, Environmental Protection Agency, and Prince George’s County Council were in attendance. Designed to ensure Metro meets stricter new discharge permit requirements that form part of the Chesapeake Bay Preservation Act, the facility pumps an estimated 27,000 gallons of water per day from Metrorail tunnels near the Largo Town Center Station. The new state of the art facility houses a unique combination of features designed to reduce energy consumption and continue Metro’s commitment to invest in sustainability and reduce operating costs. 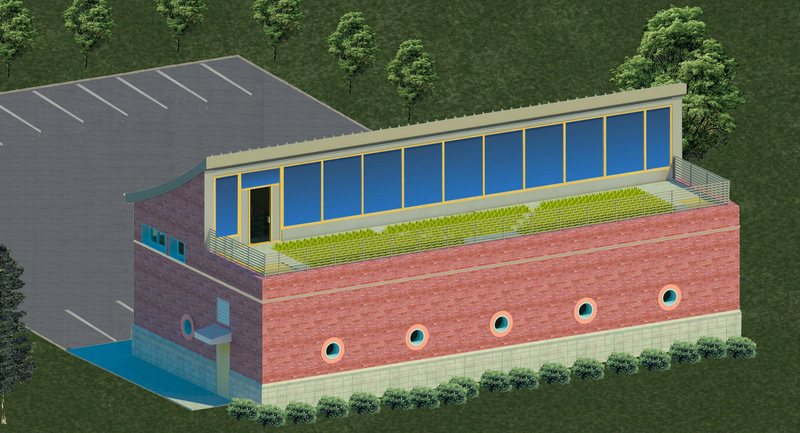 Instead of using more traditional heavy duty water pumps that have a high energy consumption and operating cost, the new Largo facility features a combination of gravity-fed treatment tanks and a high-efficiency mixing system that uses bubbles of compressed air to “circulate” the water. 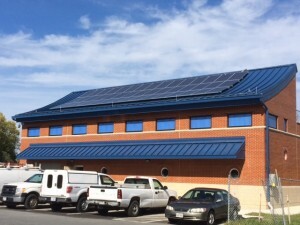 On the roof, solar panels supply extra electricity back to grid during the day and the building only draws grid power at night or during extended periods of low sunlight. Metro will prevent an estimated 3 tons of C02 emissions per year through solar energy generation alone. This is the equivalent of half the emissions from an average homes electric use over the same period. The Largo treatment facility showcases the dedication of Metro’s engineers and design staff in developing what is truly a cutting edge facility to meet State requirements and deliver ongoing operating savings for the Authority. Check out Metro’s video of the project and let us know what you think. New sustainable water treatment systems used to cool underground Metrorail Stations are projected to save Metro millions of gallons of water and hundreds of thousands of dollars annually. This month, Metro completed one of its first Sustainability Lab pilot projects – the installation of state-of-the-art water treatment systems at seven (7) chiller plants on the Metrorail system. The project will result in an estimated 400,000 gallons of water savings per location annually. Fresh water is a precious resource and Metro is doing its part to reduce strain on shared natural resources and infrastructure. The Authority uses water for a whole host of activities beyond drinking and flushing. 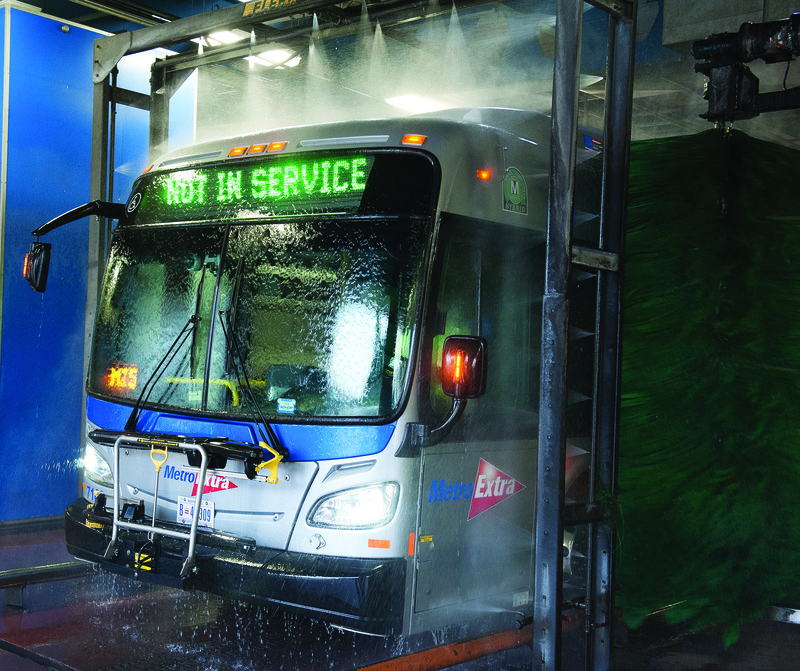 Water is used to maintain our facilities, keep stations cool, to wash buses and trains, and to clean vehicle parts. To give Metro’s water use some sense of scale, in 2013 the Authority used 98 million gallons of water, or the equivalent of 148 Olympic-sized swimming pools. Metro has already made significant investments to conserve water throughout the Authority. 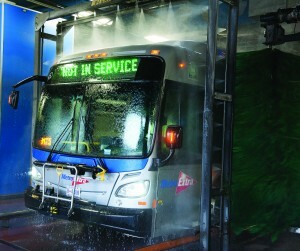 For example, all of Metro’s new and renovated bus garages feature bus wash systems that incorporate high efficiency water saving equipment. Wash water is no longer just fed from the utility and mixed with detergents. Instead, during the wash cycle the mix is drained off, transferred to large sumps and then pumped through reclaiming modules of gratings and filters that clean the water that is then reused in the following wash cycles. The bus wash system automatically calibrates not only water usage but detergent application amounts; saving on detergent use as well. The use of high efficient bus wash systems reduces the amount of potable water Metro uses and the amount of wastewater Metro generates. Also, all new Metro facility construction and major retrofits are Leadership in Energy and Environmental Design (LEED) certified and feature low-flow water fixture upgrades. Low-flow fixtures use high pressure and aeration to produce an acceptable flow without using as much water. Future facilities, including Metro’s Cinder Bed Road Bus Operations and Maintenance Facility – anticipated to be completed in 2016 – will be designed to LEED specifications and will feature many of the sustainable design features including the efficient bus wash system and low-flow fixtures. To expand water conservation in the future the Authority has set a target to reduce our potable water use per vehicle mile by 20% by 2025. This post forms part of a series featuring content from Metro’s Sustainability Agenda, part of Metro’s Sustainability Initiative. Near the Largo Town Center Metrorail Station, Metro is constructing a water treatment facility that features a modular green roof system and rain garden to filter stormwater. The facility will manage subsurface water from the track bed and has been designed with photovoltaic panels and battery storage system to achieve net zero energy specifications. Designing the facility to net zero means the building will produce as much energy as it needs on-site, without drawing power from the electric grid, to perform the entire subsurface water treatment process.